Iatrogenic coronary artery disease following prosthetic valve implantation is a rare complication. This may result from mechanical injury in the intraoperative period. The use of balloon tip perfusion catheter presumably provides the initial insult with local vessel wall hypoxia. Once the diagnosis of coronary ostial stenosis is established, the procedure of choice is coronary artery bypass surgery. We report a case of a young lady who underwent aortic and mitral valves replacement for infective endocarditis. She was then diagnosed with ostial left main stem coronary stenosis after presenting with atypical symptoms. The patient eventually underwent coronary artery bypass surgery. 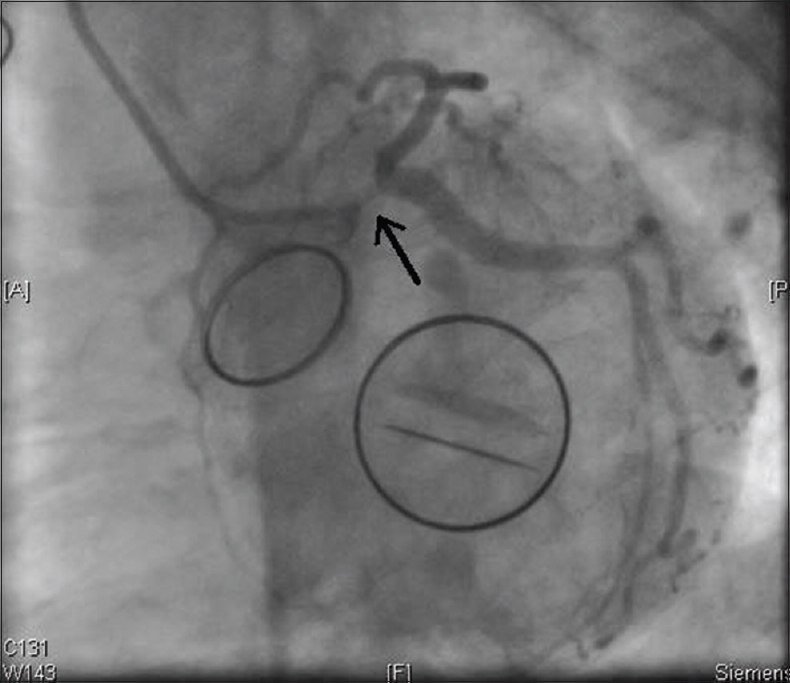 In this report, we describe a case of mitral and aortic valve replacement in a young patient complicated by symptomatic critical left main coronary artery stenosis. A 37-year-old female patient with past history of rheumatic heart disease involving mitral and the aortic valves was diagnosed with Streptococcus Viridans bacterial endocarditis causing both moderate mitral and severe aortic regurgitation with multiple embolic events and abscess formation. The patient underwent aortic and mitral valve replacement. The procedure was done using 1.8 Lof antegrade and retrograde blood cardioplegia. At surgery the aortic valve showed redundant vegetations attached to the non-coronary cusp with erosion and abscess formation between the right and the non-coronary commisures in the area of the perimembranous septum. There was also abscess formation below the none and left coronary commisures, almost penetrating the aortic root. These were debrided and painted with Iodine. The mitral valve also showed vegetations in both commisures and excess fibrosis and thickening of both cusps. The mitral valve was replaced using 27 St. Jude's prosthesis and the aortic valve was replaced using 21 St.Jude's prosthesis (St. Jude Medical Company). Postoperative course and hospital stay was uneventful and she was discharged home on aspirin, atorvastatin, metoprolol, and warfarin. One month following surgery, she started to have central- and left-sided chest pain, progressively worsening over few months. Her symptoms were atypical for angina as they were mostly non-exertional and associated with palpitations and flushing. Her resting electrocardiography (ECG) showed no evidence for ischemia and her echocardiography revealed normal left ventricular function with normally functioning prostheses. A 24-hour Holter monitor for ST segment changes was done 6 months later and revealed marked ST segment depression whenever she had chest pain. She underwent cardiac catheterization and coronary angiography [Figure 1] and [Figure 2] which showed short left main coronary artery with 90% concentric stenosis and significant pressure damping upon cannulation of the left main stem. The patient was referred for surgery and she underwent coronary artery bypass surgery consisting of left internal mammary artery to the left anterior descending artery and a saphenous vein graft to the diagonal branch and left circumflex. There were no postoperative complications. Symptoms are often clear and overwhelming: Chest pain during exercise or at rest, sudden onset of left ventricular failure without clear cause, and acute pulmonary edema. In our case, the patient symptoms were atypical (short episodes of non-exertional chest pains with palpitations) and that was the major cause in delaying the diagnosis. The rapid appearance of angina postoperatively presumably correlated with the anatomic narrowing of the coronary ostia by intimal proliferation. In our case, the most likely cause of her left main stenosis post surgery was direct injury during left main cannulation using ante grade cardioplegia. Coronary artery stenosis after prosthetic valvular replacement can be avoided by not cannulating the coronary ostia for antegrade cardioplegia, but instead using retrograde delivery as an alternative method for myocardial perfusion during open heart surgery. In the same paper they suggested that there might be a genetic predisposition for developing such lesion, as 70% of the affected population in their series had an epsilon 4 allele apolipoprotein E genotype compared to 10-15% in control group. Left main stem stenosis is a rare but lethal condition following valve replacement surgeries. The etiology of such condition is most likely related to ostial injury during cannulation for antegrade cardioplegia. Early recognition, diagnosis, and treatment are vital for patient survival. Yates JD, Kirsh MM, Sodman TM, Walton JA Jr, Brymer JF. 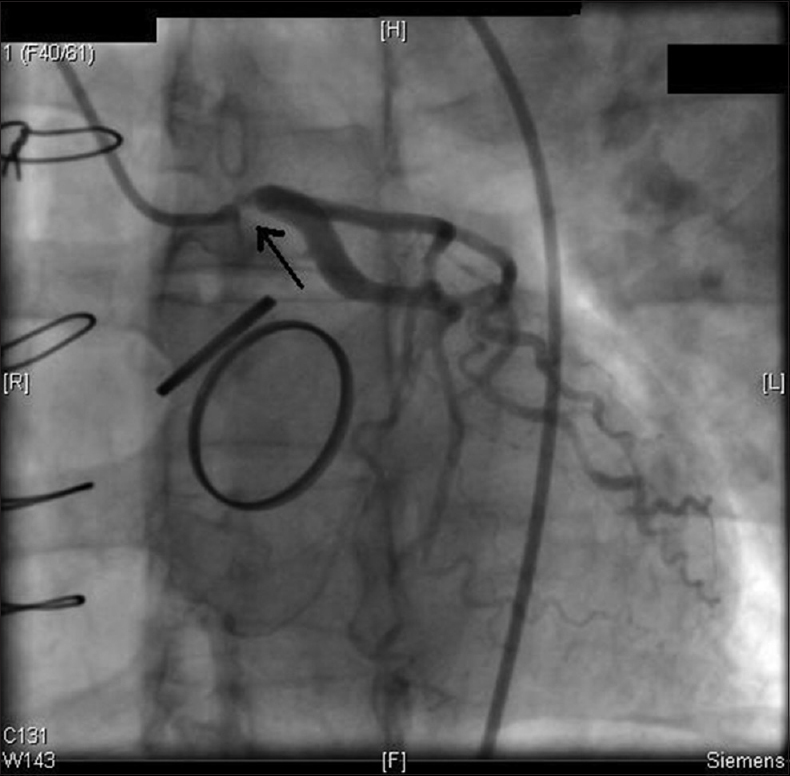 Coronary ostial stenosis, a complication of aortic valve replacement. Circulation 1974;49:535-4. Van Langenhove G, Van den Heuvel P, Van den Branden F. Main stem sub occlusion after aortic valve replacement. Heart 1989;80:530-1. Fishman NH, Youker JE, Benson BB. Mechanical injury to coronary arteries during operative cannulation. Am Heart J 1986;75:26-33. Lesage CH Jr, Vogel JH, Blount SG Jr. Iatrogenic coronary artery occlusive disease in patients with prosthetic heart valves. Am J Cardiol 1970;26:123-9. Roberts WC, Morrow AG. Late postoperative pathologic findings after cardiac valve replacement. Circulation 1967;35 4 Suppl:I48-62. Ziakas AG, Economou FI, Charokopos NA, Pitsis AA, Parharidou DG, Papadopoulos TI, et al. Coronary ostial stenosis after aortic valve replacement successful treatment of 2 patients with drug-eluting stents. Tex Heart Inst J 2010;37:465-8. Naji AF. Paraostial atherosclerosis. Arch Pathol 1964;78:461-6. Winkelman BR, Ihnken K, Beyersford F, Eckel L, Skupin M, März W, et al. Left main coronary artery stenosis after aortic valve replacement: Genetic predisposition for accelerated arteriosclerosis after injury of intact human coronary artery? Coron Artery Dis 1993;4:659-67.